​Milan manager Gennaro Gattuso refused to comment on whether Gonzalo Higuaín had played his final game for the club, following the Rossoneri's narrow defeat to Juventus in the Supercoppa Italiana. The Argentine, who has been linked with a move to Chelsea recently, started the game on the bench before being introduced by Gattuso in the second half, and when asked whether the decision to drop the striker was due to a rumoured exit, the manager clarified that it was purely due to the striker's illness. As quoted by ​Football Italia, Gattuso told Rai Sport: "He’s unlucky at the moment. He had a fever last night, we did everything to get him better, but he didn’t play much, so I preferred a fresher player. "It might seem like a joke, but honestly, it’s true! 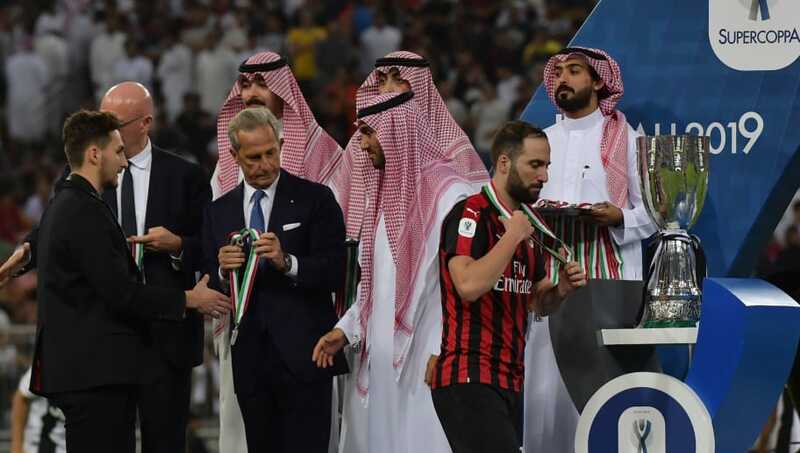 Higuaín wasn’t in the picture when the Saudi Prince came to visit because I was afraid the virus would spread among the other players, so that was my decision." ​Higuaín didn't see much of the ball against his parent-club in the second period and failed to provide a spark of inspiration for Milan, who trailed to ​Cristiano Ronaldo's header and were then reduced to ten menm when Franck Kessié was dismissed for a high challenge on substitute ​Emre Can. Gattuso was asked whether the game was Higuaín's last in a ​Rossoneri shirt, to which he replied: "I've got a burning inside me, we have 25 players, so let’s not talk about this now. We lick our wounds and will see what happens tomorrow." The Italian was also annoyed at some of the decisions made by the officials. The Italian believed VAR was utilised in the wrong manner for decisions concerning his side, in favour of ​Juve. In the first half, Patrick Cutrone was caught marginally offside from a Hakan Çalhanoğlu pass, a call that the former Milan midfielder believed was so tight, that officials should have allowed play to progress, before making the decision. Il Diavolo's manager felt hard done by, considering La Vecchia Signora were given the opportunity to continue playing when the decisions looked marginal, as Blaise Matuidi slotted home (before being flagged) and Ronaldo headed the only goal of the game in another marginal call. "It's not up to me to judge the incidents," Gattuso added. "I admit Kessié’s red card was fair. My only concern is the use of technology, as we had a tight offside call and the flag went up. Juve scored two goals and one was disallowed for offside, because they allowed it to continue and made the decision afterwards. That’s what annoys me." Milan started brightly and approached the encounter in the ascendancy, taking the game to the Bianconeri in the early stages. They would have taken the lead through Cutrone, minutes into the second half, had it not been for the woodwork, which kept the scores level before Ronaldo's winner. Despite the ​result, Gattuso indicated he was proud of his team's display, but admitted he would have liked to have won his first managerial piece of silverware with Milan. "The team showed character today, fought hard against a great opponent. Now we are without two players against Genoa. The performance remains, but there are always regrets when losing a final."